Using telescopes on the ground and in space, a team of astronomers has discovered a new type of exotic binary star in the system AR Scorpii. The rapidly spinning white dwarf star is powering electrons up to almost the speed of light. These high energy particles release blasts of radiation that lash the companion red dwarf star, and cause the entire system to pulse dramatically every 1.97 minutes with radiation ranging from the ultraviolet to radio. 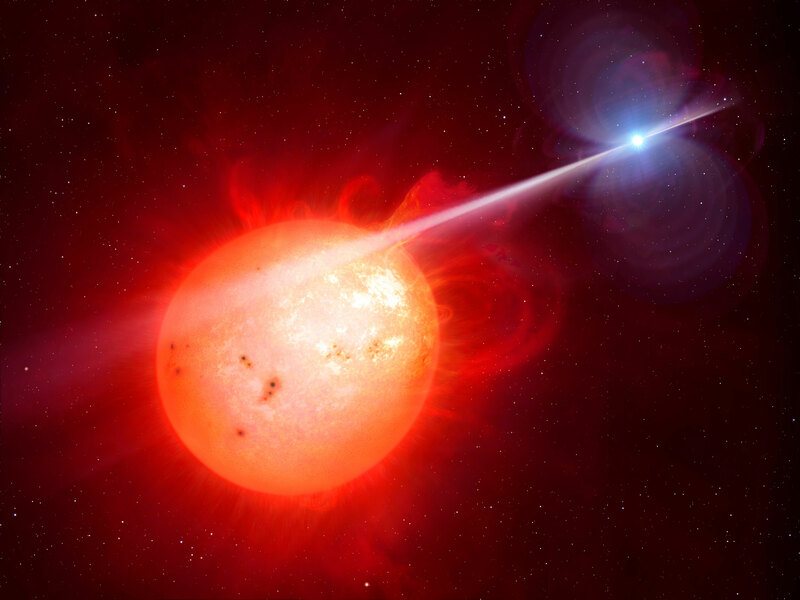 In May 2015, a group of amateur astronomers from Germany, Belgium and the UK came across a star system that was exhibiting behavior unlike anything they had ever encountered before. Follow-up observations led by the University of Warwick and using a multitude of telescopes on the ground and in space, including the NASA/ESA Hubble Space Telescope, have now revealed the true nature of this previously misidentified system. The star system AR Scorpii, or AR Sco for short, lies in the constellation of Scorpius, 380 light-years from Earth. It comprises a rapidly spinning white dwarf, the same size as Earth but containing 200,000 times more mass, and a cool red dwarf companion one third the mass of the Sun. They are orbiting one another every 3.6 hours in a cosmic dance as regular as clockwork. This artist’s impression video shows the strange object AR Scorpii. In this unique double star a rapidly spinning white dwarf star powers electrons up to almost the speed of light. These high energy particles release blasts of radiation that lash the companion red dwarf star and cause the entire system to pulse dramatically every 1.97 minutes with radiation ranging from the ultraviolet to radio. In a unique twist, this binary star system is exhibiting some brutal behavior. Highly magnetic and spinning rapidly, AR Sco’s white dwarf accelerates electrons up to almost the speed of light. As these high energy particles whip through space, they release radiation in a lighthouse-like beam which lashes across the face of the cool red dwarf star, causing the entire system to brighten and fade dramatically every 1.97 minutes. These powerful pulses include radiation at radio frequencies, which has never been detected before from a white dwarf system. AR Scorpii was first observed in the early 1970s and regular fluctuations in brightness every 3.6 hours led it to be incorrectly classified as a lone variable star. The true source of AR Scorpii’s varying luminosity was revealed thanks to the combined efforts of amateur and professional astronomers. Similar pulsing behavior has been observed before, but from neutron stars — some of the densest celestial objects known in the Universe — rather than white dwarfs. 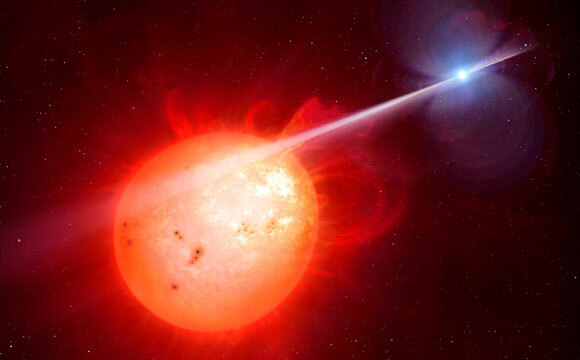 1 Comment on "Astronomers Discover a Radio Pulsing White Dwarf Binary Star"
The source of the electrons ! If you wanted to send out a measage could this be the way to send it long distance ? Send them to a source that could increace the power to send the measage !